On July 3, 2004, Captain Costello of the Edison Fire Department and his crew were attempting to put out a brush fire in a wooded area at the end of Raritan Center parkway. The fire became suspicious when they found what appeared to be a deceased body in a shallow grave, apparently burnt from the fire. 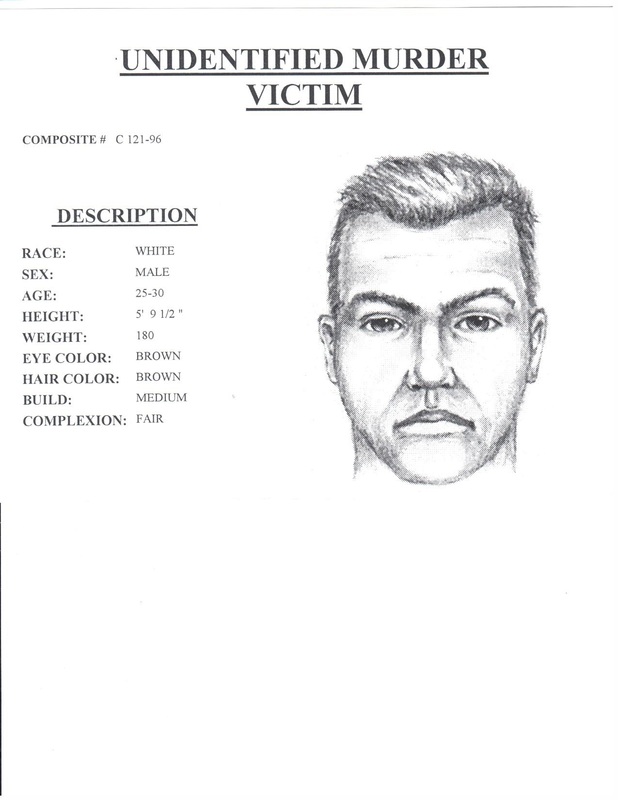 The body was described as being a Caucasian or light skinned Hispanic male approximately 25-30 years old, height 5`11", weight 210-230 lbs with black hair and very clean dental work. The body was later identified as that of Boris Varshavsky. Varshavsky died of multiple wounds suffered by an attack by unknown assailant(s). His head and upper body were badly burned. On June 22, 2002 at approximately 9:08 PM, Jose "Eric" Solano and a few of his friends were walking down Suydam Street and Joyce Kilmer Avenue in New Brunswick. It is believed Solano was involved in an altercation that ensued between members of the 18th Street and LaMugre/Los Primos gangs. It was during this altercation that Solano was fatally wounded. A passing-by civilian was also wounded during the altercation, but sustained no serious injuries. On Sunday, July 22, 2001 a 911 call reporting a shooting was made at approximately 4:25 AM from 209 Suydam Street in New Brunswick. The call came from Angela Davis, who lived at the address, and she reported that her boyfriend, William Lewis, had been shot on her back porch. Lewis was taken to Robert Wood Johnson Hospital where he was later pronounced dead at 5:05 AM. An autopsy determined that he died as a result of multiple gunshot wounds sustained during an attack by an unknown assailant. William "Tweety" Lewis, 24, lived in the apartments on Phillips Road in Somerset but was born in New Brunswick and spent a lot of time there. William Lewis was standing on the back porch of his girlfriend`s New Brunswick home, pleading to be let inside after a quarrel, when he was shot to death early Sunday. Lewis, 24, had recently served time in the Middlesex County jail for cocaine possession and was familiar to people in the Suydam Street Neighborhood where his girlfriend, Angela Davis, lives. Davis said she and Lewis had been talking through a window shortly after 4 a.m., patching up an argument about an ex-girlfriend. After about 15 minutes, someone approached in the dark and shot Lewis several times in the side and the chest. "All of a sudden he just looked to his right as if he heard somebody coming or saw somebody," said Davis. "Next thing I know I heard pow, pow, pow, and saw a lot of light, like from gunshots." Frightened, David ran inside to the living room, and Lewis made his way around to the front of the house. He crawled up onto the porch and told Davis to call the police. "It seemed like he was in a lot of pain," Davis said. "Finally he just laid back and all this blood started coming out of his mouth." Lewis was pronounced dead at Robert Wood Johnson Hospital at 5:05 a.m.
Assistant Middlesex County Prosecutor Thomas Kapsak said investigators have not made an arrest, but are pursuing a strong lead in the case. Authorities believe Lewis knew his killer. Lewis, who was not employed and had been staying with Davis at 209 Suydam St., pleaded guilty in January to the drug possession charge and served five months in the county jail, according to Middlesex County court records. He had been charged in 1997 with handgun possession and sentenced to three years` probation. Davis said she had known Lewis since they were children and described him as a nice person who liked to hang out. They had been dating for several months, and she said she feels partly to blame for his death. "I do blame myself; if I just would have let him in. But on the other hand, who knows, (the gunman) might`ve shot up for kicked my door in," said Davis. "Whoever this person was, I believe they were very angry to be shooting the way they were. That was a lot of gunshots." Davis said she is now afraid for her own life, though she did not see the gunman`s face in the dark. "It`s unbelievable, it`s like a nightmare to me. It`s like it`s not real, but I know it happened." Lenny Suskin used to call the Middlesex County Prosecutor’s office every week like clockwork. That was back in April and May when the investigation of his son’s murder had just begun. But yesterday from his Long Island home, Suskin said his calls to the prosecutor’s office are now down to a trickle – maybe just once a month. It’s not that he is any less interested in the progress of the investigation of Piscataway Councilman Jeffrey Suskin’s murder. It’s just that the five-month probe into the slaying hasn’t turned up any suspects. And Lenny Suskin’s hope that the murderer will be caught may be slipping away. “This whole thing is driving me crazy,” he said. “I don’t understand how no one could be brought in (as a suspect). It just drives me crazy. Lenny Suskin, a carpet retailer, said he believes the search for his son’s killer has been put on the back burner by prosecutors. Jeffrey Suskin’s body was discovered by his estranged wife April 14 in the Jennifer Court home they shared with their three-year old son, Joshua. The boy had been the main focus in bitter divorce proceedings between Suskin and his wife Beth. Authorities said Suskin had been strangled. Jeffrey Suskin was also involved in an angry dispute with his father-in-law, Louis Goodtree, who accused Suskin of mistreating his wife. Suskin, a councilman since 1979 from Piscataway’s 4th Ward, then sued Goodtree for libel, defamation and extortion for trying to force him from his 1986 re-election bid. Yesterday, Assistant Middlesex County Prosecutor Thomas J. Kapsak did not want to comment specifically on Lenny Suskin’s allegations. He did say, however, that while no new information is available, the investigation is continuing. Mr. Santos drives a jeep-like 1986 Isuzu Trooper with license plate number, BAR-80E. It was revealed that the victim was wearing blue jeans and a blue & white shirt and boots, brown leather and had approximately $1,000 in cash on hand at the time that he left home, and that he was also wearing a gold wedding band. If you have any information in regards to this missing person please contact the Middlesex County Crime Stoppers. Investigators who have been searching for an Edison plumbing contractor missing since May 18 went public yesterday seeking any information on Dominick Santos, who apparently dropped out of sight without a trace. Middlesex County Sheriff Joseph C. Spicuzzo is asking anyone with information to notify either the sheriff’s department or Edison police missing persons units. Santos, 47, was last seen by his wife, Hope, 42, at 2:45 PM on May 18 when he drove away from their home on Inman Avenue in Edison, supposedly en route to his lawyer’s office in Newark, according to Spicuzzo. The sheriff said nothing has been seen since of Santos or his burgundy-and-tan 1986 Isuzu Trooper, a Jeeplike four-wheel-drive vehicle. The license number is BAR-80E. Spicuzzo said Mrs. Santos reported her husband missing on May 24. She delayed making the report because she and her husband had had a dispute and she believed he might have “gone somewhere to cool off,” according to the sheriff. Investigator Michael D’Apolito of the sheriff’s staff said there is no reason to suspect foul play or criminal involvement. He said there had been no checks written on Santos’ bank accounts and no record that any of his credit cards had been used since the day he disappeared. D’Apolito said Santos apparently had no business problems and that his contracting concern is being contracted by his son. The company is located in Edison but most of Santos’ contracts have been in the Newark area. Spicuzzo said Santos is white, 5 feet 10 inches tall, 260 pounds, with graying hair. She was at her fraternal grandparents’ home at 2802 Rivendell Way in Edison, New Jersey when she became unresponsive and had trouble breathing. She was transported to the hospital at 10:45 AM and was pronounced dead at 6:43 PM. It is believed that the infant suffered intentionally-inflicted head trauma, and thus the case is considered a homicide. The mysterious, but unrelated deaths of two infants have been under investigation for months by Middlesex County authorities and are being treated as homicides, the prosecutor said yesterday. Prosecutor Robert W. Gluck also disclosed that the death May 20 of Zarinah Brown, a 2-month-old girl, was classified Aug. 31 as a homicide, after forensic tests showed she died of head injuries. An investigator working on the case stressed, however, that police have not determined whether the baby girl was killed intentionally or accidentally. The girl, who lived with her mother in Newark, died in a New Brunswick hospital where she was taken during a visit with her father, an Edison resident. The deaths, which were not previously reported by the prosecutor’s office or police, were revealed following press inquiries about the total number of homicides committed in the county during the year. The fully clothed male is described as age 25-35, 5’9” tall, approximately 160-180 lbs, sandy colored short hair, clean shaven, brown eyes. The male was dressed in designer label clothing, with a waist length black leather jacket with a fur collar, multi colored sweater and dark green corduroys. The victim was shot numerous times in the head and bound behind his back. 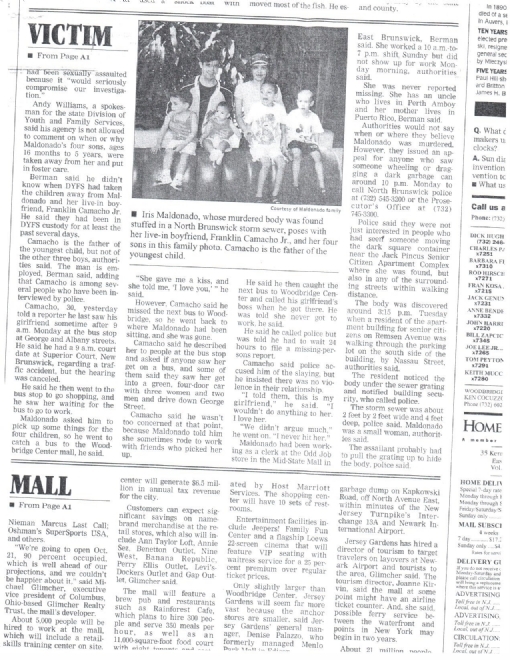 On May 11th, 1990, police were dispatched to the area of Lake Nelson Cemetery off of South Randolphville Road where human remains were found by hunters in the area. The body was naked, severely decomposed, and appeared to be that of a black woman. Police believed she had been murdered about a month before her body was found. She was later identified as Vivian Givens. It was unclear to the police if she was killed near the site where her body was found or if she was killed somewhere else and transported to the area after. PERTH AMBOY – A man found slain in the bedroom of his Parker Street home Monday night had been battered repeatedly in the head with a blunt instrument, authorities said yesterday. Police and Middlesex County investigators yesterday searched for clues in the slaying of Anthony Kuzniak, 59, whose partially clothed body was found by a boarder in Kuzniak’s home at 747 Parker St. The victim’s upper chest, neck, and head were covered by a folded-over blanket, and the boarder found pornographic reading materials next to his body on the bed, according to police reports. Middlesex County Prosecutor Alan A. Rockoff said there are no suspects in the case. […] Kuzniak’s body was found at 5:25 PM Monday by Lynn Saunders, who rented a room in a converted sun porch on the first-floor of the single-family home. The House is across from the railroad tracks near the old Union Carbide property. “There is an ongoing investigation and nobody has been excluded from the investigation,” Rockoff said. Saunders could not be reached for comment yesterday. An autopsy performed by Dr. Kong L. Tan, deputy county medical examiner, attributed the cause of death to a brain hemorrhage caused by a fractured skull. Rockoff said no murder weapon has been found. But according to police reports, a crowbar with “wet liquid” on its tip was found on a bed in a first-floor bedroom fo the house. The victim was found in a second-floor bedroom. “It has not been determined that that was a weapon,” Rockoff said. Burglary did not appear to be a motive in the slaying, Rockoff said. Police said no items inside the house appeared to have been disturbed, although a thin gold chain was found on the stairway landing between the first and second floors. There was no sign of a forced entry. Authorities and neighbors said Kuzniak’s home had been burglarized in September. An unknown amount of items were taken from the house at that time, Rockoff said. On December 3rd, 1987, the body of John “Jack” O’Rourke was found inside of his taxi off of Burnet Street in New Brunswick. He had suffered from fatal wounds. A man wearing a black leather jacket was seen in the area was described as white, approximately 28 years old, heavy set with brown shoulder length hair, and clean shaven. On April 14, 1983 at approximately 2 PM the body of Robert B. Adsit was found in his car at the soccer field on Ticetown Road in Old Bridge Township. Officers who found his body were responding to reports of shots being heard shortly beforehand. Adsit, a 30 year old Old Bridge resident, was dead in his Buick when police arrived. An autopsy later determined that he died from a gunshot wound to the head. OLD BRIDGE — The body of Robert Adsit, 30, who police said was shot in the head and hand at close range, was found in a parked car in an isolated portion of the township yesterday. Adsit, who lived in the London Terrace apartments on Westminster Boulevard, was found shortly after a caller told police at 1:50 PM to go to the Ticetown Road soccer field because a man was in a car there, according to Detective Bill Lynch. Authorities would not reveal whether the caller was male or female. Lynch said Adsit was in the driver`s side of his wife`s car, a cream colored 1976 Buick Skylark, which was parked in the lot of the township-owned field. Investigators believe he was shot with a handgun at close range while at the field, located in a deserted section of the township about 100 yards from the Monmouth County border. Middlesex County Assistant Prosecutor Thomas Kapsak said Adsit was shot more than once, probably while in the car, and police said he was struck in the face and right hand. The weapon was not recovered. Police would not say whether they believed the assailant was in or out of the car. The driver`s-side window was half open when police arrived. There was no sign of struggle, nor were any of the car windows shattered, police said. An autopsy was to be performed today by the Middlesex County Medical Examiner`s Office. Police have been interviewing many of Adsit`s acquaintances, and investigators plan to speak with people from Onieda Trucking Co., Carlstadt, where the victim worked. Adsit, a forklift driver on the midnight shift at Onieda, had returned from his job at about 9 AM. He and his wife, Florence, had gone to the Pathmark supermarket yesterday morning, police said. According to police, Adsit, a record buff, was unable to find a record he was looking for there. He was believed by his wife to be on his way to the Sayrewood Shopping Center when he left their apartment at noon. Adsit lived in North Jersey before moving to Old Bridge several years ago, a friend said. The friend, who asked not to be identified, described him as a person who would not have enemies. "He`s the type of guy who would stop a fight," said the friend as he was leaving the police station yesterday. Another friend said Adsit, who was 6 feet 3 inches tall, was "a pussycat, despite his size." Lynch said there was no known motive for the shooting as of last night. "Everybody I talk to said he was a nice guy, not a fighter, and had no enemies," the detective said. A woman who answered the phone at Onieda last night said none of the employees working who were colleagues of Adsit wanted to talk. "We`re all pretty upset," she said. Beside his wife, Adsit lived with his daughter and three step-children, police said. Funeral arrangements [were] by the Michael Hegarty Funeral Home, 3700 Route 9. On April 20, 1984 at approximately 1:00 AM, security guard John Lawson, age 50, was found dead in the parking lot at the Private Formulations Inc. in Edison at 460 Plainfield Avenue, where he was employed. Lawson was believed to have left work at approximately 7:30 PM the previous night, according to coworkers. His pockets were emptied and his car was missing, a possible victim of a robbery that escalated fatally. Lawson was pronounced dead at the scene at approximately 1:42 AM the same day.